Thatch-Safe® is a layered product designed especially for thatch which has had LABC (National Building Control Approval) since 2008. It is a flexible barrier (1M X 5M) which is placed horizontally over the rafters and under the thatch. Thatch-Safe® has both 1/2 hour fire resistance and 1 hour fire integrity. It is light, flexible and easy to fit so that it has benefits for both new builds and also for older properties with more undulating roofs. It is designed to go under the thatch but also around the chimney if a risk of heat transfer is identified. Unlike other solutions it addresses the major cause of thatch fires which is heat transfer from chimneys to the thatch. 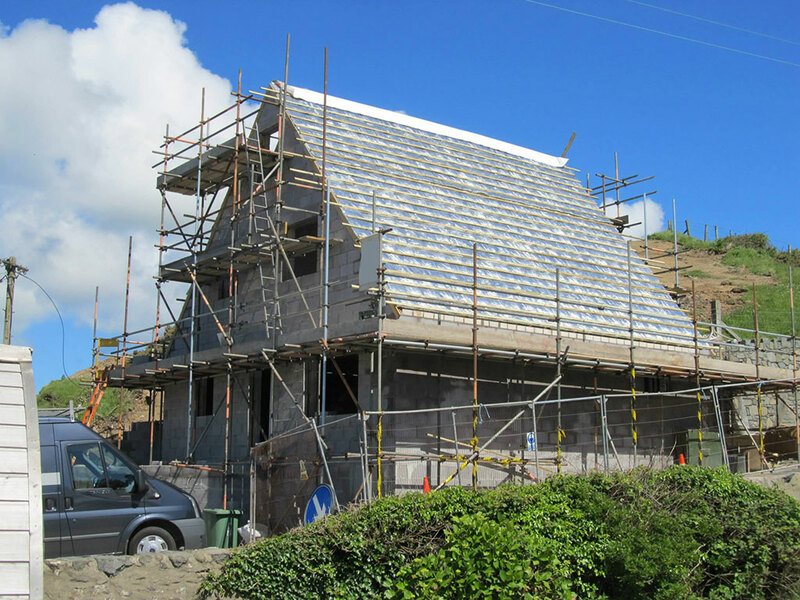 Many thatchers, architects, surveyors, firemen, builders and thatched home owners have been involved in the development of this product so that it addresses everyones requirements. It has insulation of 1/2 hour and so is a one product solution in meeting fire retardant and insulation requirements. With the thatch, it meets 0.2 µ value so that no additional insulation products are required to meet building regulation requirements. The lack of counter battening required to fix, means that there is no gap between the thatch and fire barrier which can produce a ‘chimney effect’ should the thatch catch fire, and no ‘dew’ points (condensation) should it not. The fact that it is quick and easy to fit, compared to other solutions, makes it a cost effective option in meeting fire retardant and insulation requirements. Savings are made in both the product and the labour element required to fix it to the rafters. Not only does Thatch-Safe® meet building regulation and insulation requirements it is tested as micro-porous. Should the thatch not catch fire (which the majority should not) it reduces the sweating potential and thus the premature rotting associated with solid boards and barriers. It has benefits for the lifespan of your thatched roof. The Thatch-Safe® Model is a simple and effective solution. The Thatch-Safe® Model Plus has the addition of a fire retardant spray called Magma Firestop on the outside of the thatch making a fire retardant sandwich. For a friendly talk with our experts on Thatch-Safe® or anything that you have seen on this website please send us an email or call on 02380 428 992.